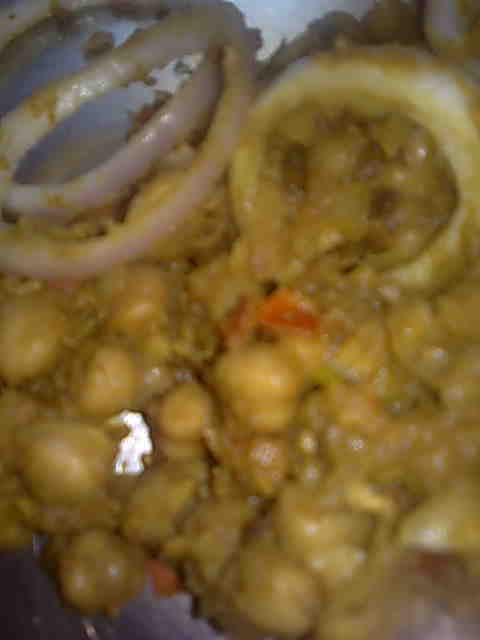 Ghugni is a Bengali version of chole or ragda. Here I have used kabuli chana or chickpeas but green peas or matar is also used for making ghugni. 1. Soak the kabuli chana overnight. Drain. 2. Pressure cook chana with salt and water. Let 1 whistle come, then cook on medium heat for 30 minutes. 3. Heat oil in a kadhai/ wok. Add bay leaf, cloves, cumin seeds and cardamoms. Let them splutter. 4. Add onion and sauté till light brown. 5. Add ginger-garlic paste and sauté for 1 minute. 6. Add tomato and rest of the spices and salt. Cook till oil begins to separate. 7. Crush a handful of chana and add along with rest of the boiled chana. 8. Boil on a high heat for 3-4 minutes. Lower heat and simmer for 2-3 minutes. Cook till you get the desired gravy consistency. 10. Garnish with onion rings and serve hot ghugni with either roti, luchi, poori or rice.